If you're a connected runner or a cyclist, chances are you'll have come across fun Strava GPS drawings made by following a pre-planned route and uploading the results to the app. It's a trend that's been bubbling under for three or four years now with the most awesome works quickly going viral. The routes needed to create the outlines of popular characters, constellations and messages are meticulously planned out in advance and riders and runners often get addicted to adding a creative element to their sports activities. We've picked some of our favourite Strava GPS drawings below, let us know yours in the comments. Look. At. This. Martyn Driscoll and Alan Stone ran a 28 mile/44km route around Upper Brynamman, Carmarthenshire - Wales, of course - to create this awesome GPS drawing of a Welsh dragon earlier this year. As you can see, the run took them over eight hours to complete. You can view Martyn and Alan's elevation, splits, calories burned and more on their Strava activities. Canadian cyclist Stephen Lund is a self-styled Strava artist with a ton of drawings behind him. Lund does GPS doodle ride-alongs in British Columbia, sometimes plots routes that are upside down - like the mermaid above - and his latest project involved a 68 mile ride to produce a sea monster outline that covers nearly 1 billion square feet. Check out Lund's Sketchbook of a GPS Artist blog for more drawings - Star Wars, Teenage Mutant Ninja Turtles, Gandalf & more - plus the stories and planning behind them. Pretty wild. Here's a few more faves below. Stephen Lund's Darth Vader GPS drawing on an upside down map of Victoria and Oak Bay, British Columbia. Lund's dinosaur outline - the route is planned so that when the map is rotated 90 degrees, you can see the drawing. Kinda corny, kinda sweet but definitely a bold move. In 2014, San Francisco based cyclist Murphy Mack rode 18 mile/ 29km around the grid of his home town to propose to his girlfriend by drawing a heart and spelling out Marry me Emily? It took him 80 minutes to complete the GPS proposal and when he posted it, Emily McLanahan - his intended - commented 'Yes! I love you!" Good job really, could have been super awks otherwise. British Strava artist and cyclist David Taylor has created a whole bunch of interesting GPS drawings including a horse in the New Forest. We're a fan of his neat and elegant Ursa Major, which he made by cycling for 5 hours 48 minutes around the Cotswolds in 2015. Taylor's profile pic on Strava is one of his first creations - a bicycle. What to do if you live in a place that always votes the other way? London author and cyclist Chris Ward rode 9km around Soho and Marylebone in the centre of the city to spell out 'VOTE Labour' to gently troll Conservative voters. Nice touch that the red route matches the colours of Ward's preferred party too. 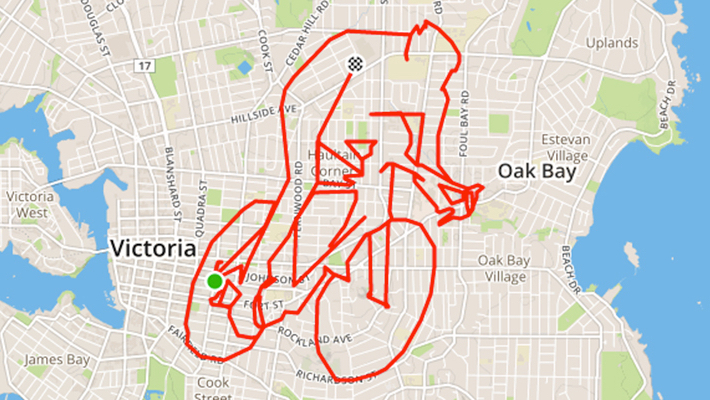 Strava artist Wally GPX has produced more than 500 Strava drawings, which is pretty incredible. One of his latest pieces is inspired by one of our fave Pixar movies. He cycled 6.27 miles to make an adorable scene of robots Wall:e and Eve near Patterson Park in his home town of Baltimore, proving that the best Strava art doesn't always have to involve long rides. If you want to see more Strava drawings, check out the #StravaArt hashtag on Twitter. Tell us your favourite Strava drawings - and who is making them - in the comments below.